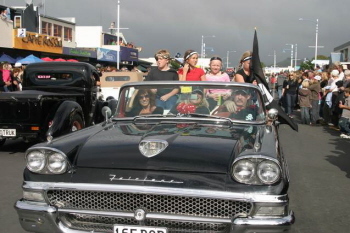 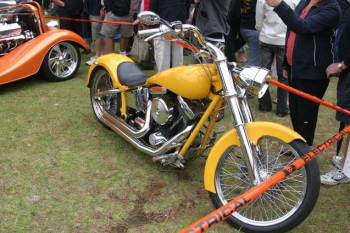 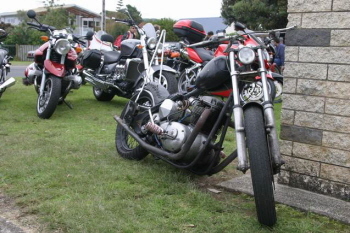 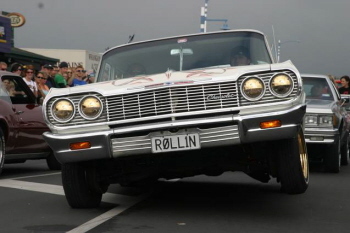 The Beach Hop is New Zealand's biggest Nostalgia Festival and celebrates the music, fashion, culture, cars & bikes of the 50s & 60s. 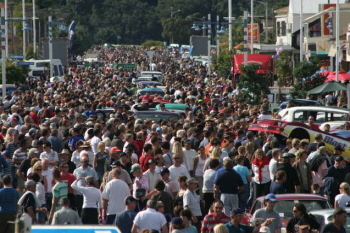 Held in the small seaside resort of Whangamata, usual population 4000, the town bursts at the seems as 70,000 people pile in for the 5 day festival. 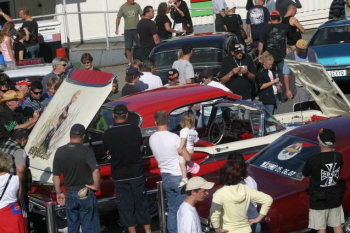 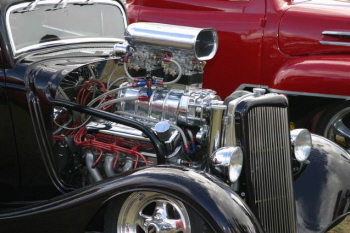 With over 1100 registered cars, and hundreds more there just for the look, there is plenty to take in. 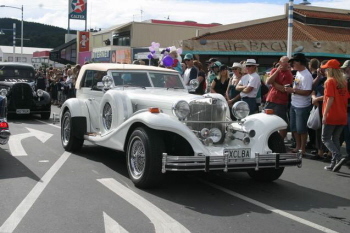 Each day featured a cruise to a different beach resort under glorious blue skies with Pauanui on Wednesday 25th April being the first. 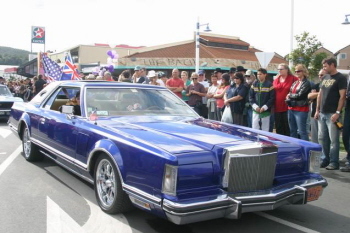 Thursday 26th saw over 350 cars head off on the Harcourts Cruise the Loop - a 180 mile tour around the peninsula with dolphins swimming in the bays as the cars cruised by. 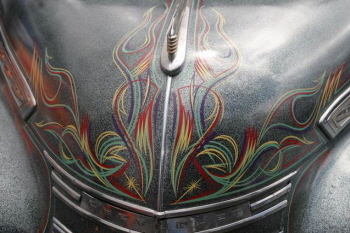 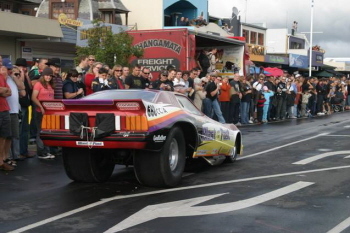 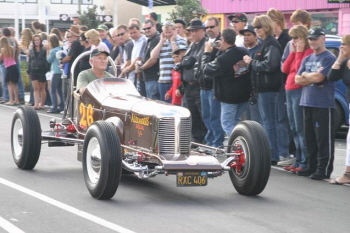 Thursday's Drive in Movie was "The World's Fastest Indian" and special movie about a very special New Zealander. 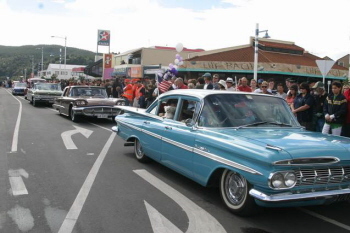 Friday's Streets Ice-cream Thundercruise saw 800 cars make the 20 minute journey to Onemana Beach where they were able to park on a grass reserve right on the beach. 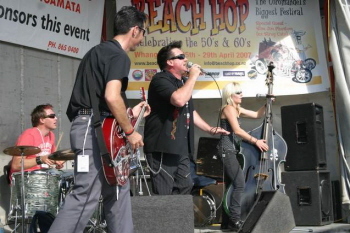 Here Rockabilly legend Al & the Wild Kats performed in the sand dunes. 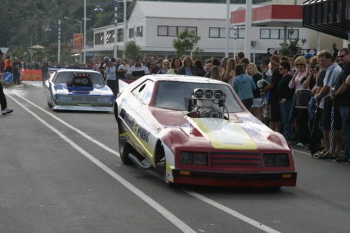 The first night cruise kicked off Friday night with 3 hours non stop action along an enclosed circuit for entrants only. 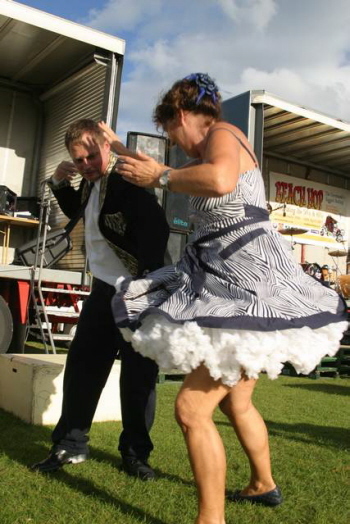 At 9pm the gates were closed and Rock'n'Roll bands started to perform at various venues around the town centre. 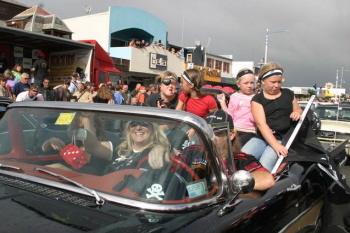 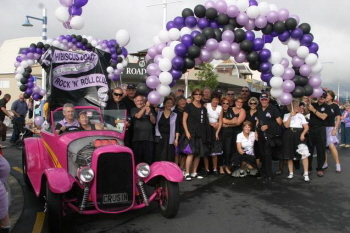 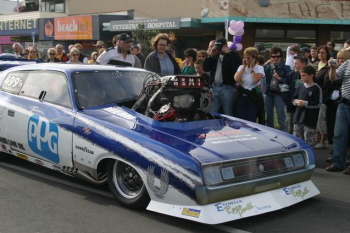 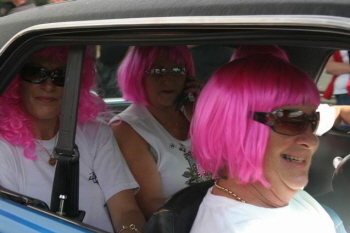 Saturday's Repco Grand Parade is the highlight as 1100 cars enter the closed town centre area from 2 directions and park up. 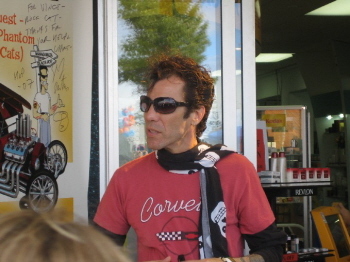 The parade was led by special guest Slim Jim Phantom of USA band the Stray Cats followed by dragsters, funny & pro mod cars. 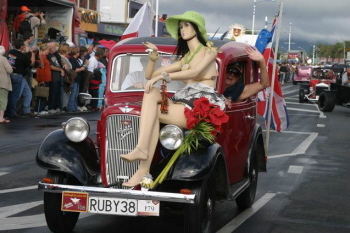 The parade took over 1 hour and then 8 stages kicked into life featuring 7 bands from Australia and 11 from New Zealand. 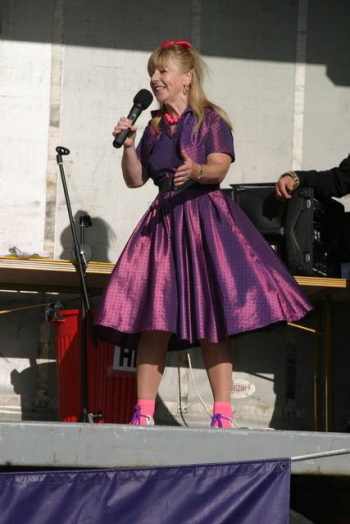 The afternoon wound up with the Rita Sue Retro Beauty Show (39 fine looking ladies), Prize Giving and Hop Idol with special guests. 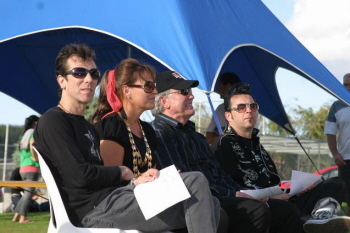 Slim Jim Phantom then joined top Australian Rockabilly band the Retro Rockets for a wild performance. 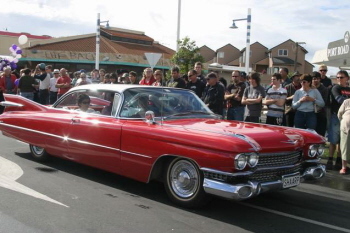 Saturday's night cruise & street party continued along from Friday night. 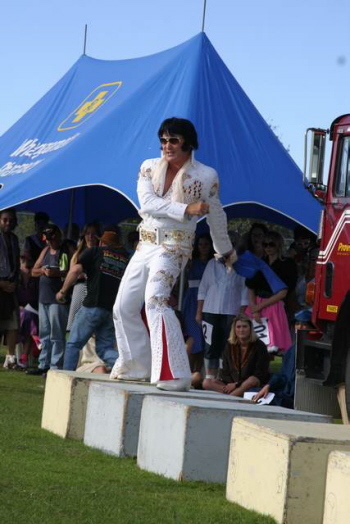 The festival wound up in fine style with the Jennian Home 60s Surf Fest (5x identical custom 60s long boards were used), Rock'n'Roll Church Service and Nostalgia Fair with Arts & Crafts, Auto Trade & Swapmeet and Car Show. 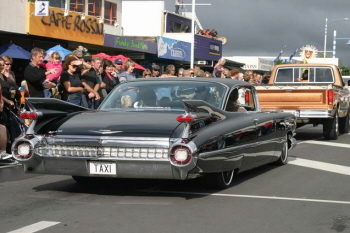 Here the Top 5 Cars & Bikes from the public voting on Saturday were brought together for the Transitatiner Top 10 Shoot Out where the public could vote once again by placing coins into the bucket by each car. 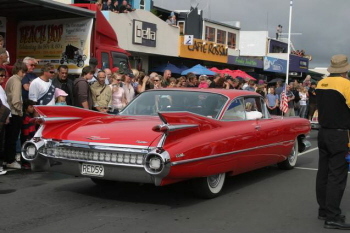 The winner was Mark Hayward with his 50 Cadillac who raised the most money while 3 bands performed on the stage. 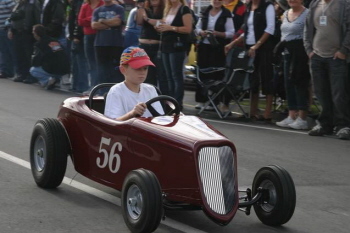 Chris Mangan's son is on the right track!